2. 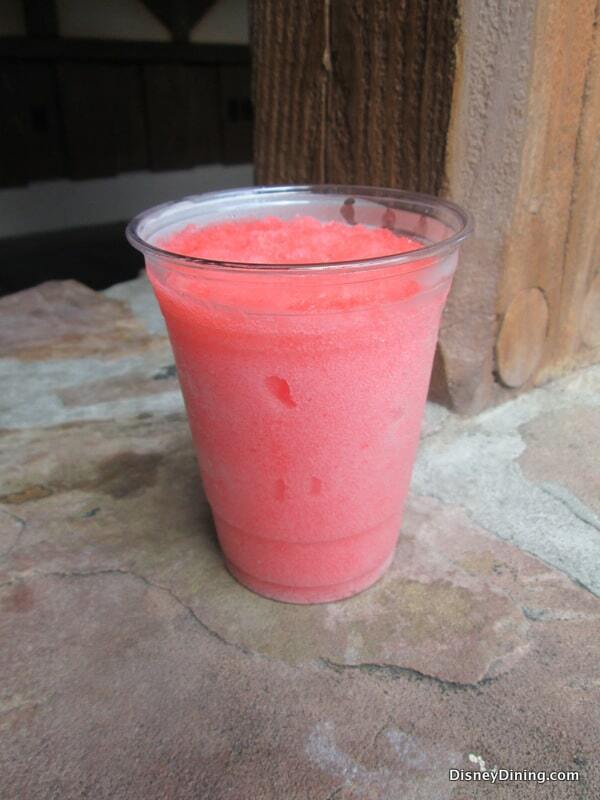 Raspberry Lemonade Slushy – Cheshire Café – The Magic Kingdom is one of the most beloved locations in all of Walt Disney World and many guests love to spend time in both Fantasyland and Tomorrowland. Since these two areas are so popular, it is no surprise that the walkways that connect them are high traffic areas that tend to be busy all day long. Since there is so much foot traffic in the area, guests tend to overlook an amazing quick service location in Fantasyland that serves up unique snacks and beverages that are underrated. Cheshire Café can be found right near the Mad Tea Party making it appropriate that the location’s name pays homage to the Cheshire Cat from Alice in Wonderland. Guests who stop to order something from the Cheshire Café should definitely try the Minute Maid Raspberry-Lemonade Slushy which is served with a Mickey straw. Perfect parts sweet and sour, guests absolutely love enjoying a Raspberry-Lemonade Slushy on a hot day in the Magic Kingdom!